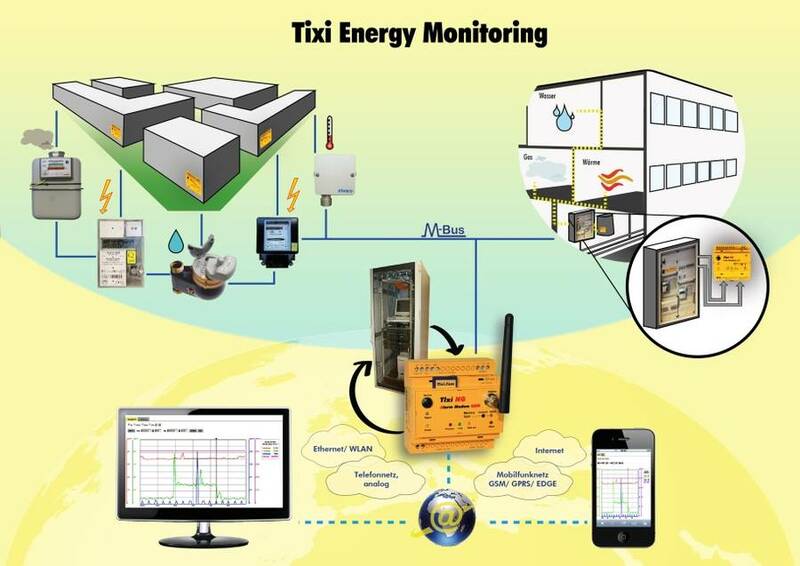 The topic energy and Smart Metering has become increasingly important within the last years. All the companies involved, including of course we as manufacturer have to show these development quite plainly. What distinguishes a really good energy-managament-system? What do you need to meet these aims - what do you need to become a "smart user"? You have to combine components relating to the field of data acquisition and data visualisation as well as data evaluation. According to the coverage these functions can be excecuted self-sustaining by using Tixi Smart Metering Gateways. Starting with remote meter readings of all different kind of meters, sensors and PLC's to the point of data visualisation. By using these data records it is possible to demonstrate user-analyses and optimization potentials. In bigger projects the Tixi Gateway is able to send all the collected consumption date over different communication channels (analoge, GSM/GPRS/EDGE, Ethernet) to higher SCADA or management-systems. For integration, Tixi gateways supports all standards like CSV, XML or even http.